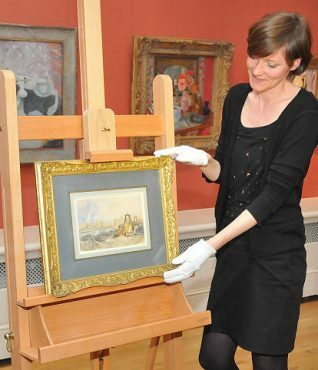 A Turner painting bought for the city will go on public display for the first time in 100 years at the end of this month. The watercolour which depicts The Chain Pier by J M W Turner RA, (1775 -1851) was bought by the Royal Pavilion & Museums service for £225,000 at auction at Christie’s New York earlier this year. The funds required for the purchase came from the Heritage Lottery Fund, the Art Fund and the Royal Pavilion Museums Foundation. This external funding was provided specifically for the purpose of saving the painting for the nation and no Brighton and Hove City Council money was used. The Brightelmston Suspension Pier Company was formed in 1821 and the 1134 foot pier, the full title of which was the Royal Suspension Chain Pier, opened on 25th November 1823. Designed by Capt. Samuel Brown, it had four 260 foot spans and cost £30,000. 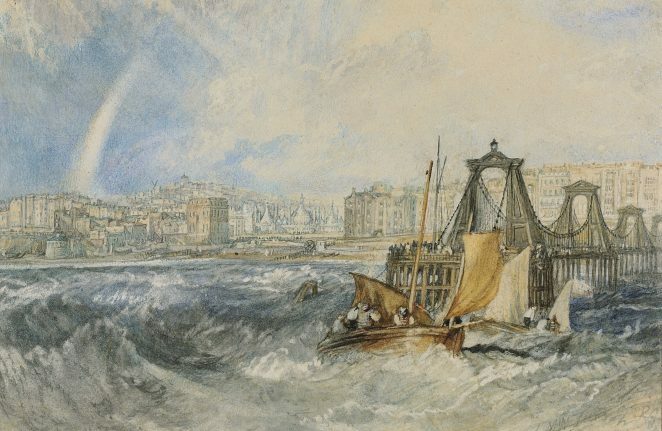 It is believed that Turner visited the town shortly after the pier opened, and the watercolour he produced was one of thirty-nine for Picturesque Views of the Southern Coast of England (1825), a publication with engravings by William Bernard and George Cooke. Apart from its obvious importance as a glorious example of Turner’s innovative watercolour techniques, it is a valuable pictorial record of the town at the time. The background shows many fascinating details of the early 19th century landscape. The Royal Pavilion is visible, and behind the pier is the Marine Parade, which was being built in the mid-1820s. St Nicholas Church and Vine’s Mill are on the skyline and it is possible to see Lamprell’s famous baths on the far left of the image. Brighton and Hove are very fortunate to have become the guardians of such an important work of art which gives a fascinating 19th century snapshot of the city. Having seen the painting close up I can assure you that the photographs here cannot possibly do justice to the skill of the artist, and immediacy of the image – you must see it for yourself. The watercolour painting will go on show at Brighton Museum & Art Gallery, in the Royal Pavilion Gardens, from March 31 to April 22. Joseph Mallord William Turner,R.A. Brighthelmston, Sussex, c1824 © The Royal Pavilion & Museums, Photograph © Christie’s Images Ltd 2012. Turner must have done another painting of the Chain Pier, I have one (a copy not the real thing) which shows still waters and a sailing ship at the end of the pier. Editor’s note: You are absolutely right Peter, there is another Turner painting called The Chain Pier, Brighton circa 1828, which is an oil on canvas. It is in the Tate Gallery. Interesting – especially how open the front was in those days. No gaudy hotels (or wheel), to hide the Prince Regent’s folly! I wonder if the tiny Turner ventured out in a boat to get the image, or whether it was an imaginative sketch dreamed up in a hostelry, after a brisk walk on the front? At any rate, it looks as if the whole area is about to be devastated by a significant storm. Does the Met Office record this? You could have constructed several piers with the price of the painting couldn’t you? !